RONALD J. MACLEAN – of Woburn, Sat., March 31st. Beloved husband of Ruth H. (Fraser) MacLean. Loving father of Sheila Edwards of Contoocook, NH and Rhonda MacLean of Woburn. Cherished grandfather of Scott MacLean Edwards, his partner Leslie Hicks of Salisbury, NH. His forever son-in-law and friend, David Edwards of NH and his favorite, Cindy “Cin-Cin” McCarthy of Woburn. Dear brother of Joan MacLean of Woburn and the late, James and Paul MacLean and Mary Joyce and brother-in-law to Marianne MacLean of Acton. Also survived by several nieces, nephews and friends. A Funeral will be held from the Lynch-Cantillon Funeral Home 263 Main St., Woburn on Thurs. April 5th at 10:30 a.m. followed by his Funeral Mass in St. Barbara’s Church 138 Cambridge St., Woburn at 11. Relatives and friends are respectfully invited to call at the funeral home, Thursday morning, 9 – 10:30 a.m., prior to the Mass. For directions or to leave an online condolence, please visit www.lynch-cantillon.com or Facebook under Lynch-Cantillon Funeral Home. 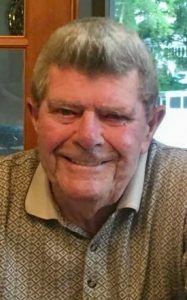 Ronald J. MacLean, a long-time resident of Woburn, died peacefully, Saturday, March 31st at his home, with his loving family by his side. He was the beloved husband of 61 years to Ruth H. (Fraser) MacLean. Born in Cambridge and raised in Arlington, Ronald was a son of the late Ronald and Agnes (Molloy) MacLean. He was a graduate of Arlington High School and received his Bachelors Degree in Electrical Engineering from Northeastern University. For 21 years, Ronald worked full-time for the National Guard, something he was so proud of. He was also an Electrical Engineer for Boston Edison for 30 years until retiring. Ronald was a lifetime member of the Woburn Lions Club. He also enjoyed golfing and solving word puzzles. He was an avid history buff and kept up with current events. His greatest joy in life came from his family whom meant the world to him. He will be greatly missed. Loving father of Sheila Edwards of Contoocook, NH and Rhonda MacLean of Woburn. Cherished grandfather of Scott MacLean Edwards, his partner Leslie Hicks of Salisbury, NH. His forever son-in-law and friend, David Edwards of NH and his favorite, Cindy “Cin-Cin” McCarthy of Woburn. Dear brother of Joan MacLean of Woburn and the late, James and Paul MacLean and Mary Joyce and brother-in-law to Marianne MacLean of Acton. Also survived by several nieces, nephews and friends. A Funeral will be held from the Lynch-Cantillon Funeral Home 263 Main St., Woburn on Thurs. April 5th at 10:30 a.m. followed by his Funeral Mass in St. Barbara’s Church 138 Cambridge St., Woburn at 11. Relatives and friends are respectfully invited to call at the funeral home, Thursday morning, 9 – 10:30 a.m., prior to the Mass. For directions or to leave an online condolence, please visit www.lynch-cantillon.com or Facebook under Lynch-Cantillon Funeral Home. Ruth, Sheila, Rhonda and family – so sorry for the passing of Ron – he was loved and very well cared about and treasured by all of you. to keep you safe and healthy. So very sorry to hear of Ron’s Passing. He was always a kind gentle man. May he RIP an may all his beautiful memories live in your heart forever. Sheila, I’m so sorry, many hugs my friend. May his soul find peace as he watches over you.